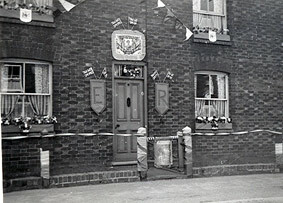 A programme of festivities was organised in Olney to mark the Coronation of Queen Elizabeth II on 2nd June 1953. The details are listed in a Souvenir Programme the cover of which is shown in the picture . The activities were well supported and an undoubted success even though rain fell for most of the day. 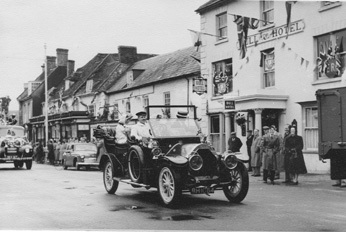 Spirits were high for the Carnival Procession, as shown in the photograph below taken outside the Bull Hotel. The motor car shown is a French Vinot owned by Robert Soul. The driver and passengers are members of the Mann and Morgan families. It is said that fireworks including jumping jacks were thrown from the car to liven up proceedings! Good neighbourliness ensured that most people in the town saw at least some of coronation ceremony in London on television. In 1953 the number of televisions in the town were few and far between, and had very small (10 or 12 inch) black and white screens. According to the minutes of the Senior Citizen’s Club, plans were made ‘for the old people to see the coronation programme on a TV ‘projection set’ in the Bull Hotel’ between 11.00 am and 5.00 pm. Tea would be served at 11.30 am and again at 3.00 pm. Ambulance representatives would be in attendance! The rain was heavy and prolonged enough to postpone some of the planned street parties. The party organised for Cowper Street was held on the following Saturday, 6th June, in the Ambulance Hall in Wellingborough Road. The photograph (right) demonstrates that it was well attended. The house in the photograph (below) won the competition for the best decorated house. The first prize was three guineas (£3.15). 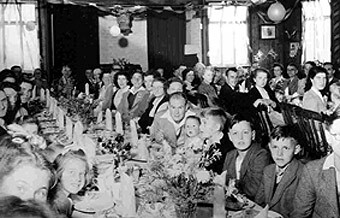 Very few real plants were in bloom on 2nd June, so the houses were mostly decorated with hand-made colourful artificial flowers, such as sweet peas, shown in the (unfortunately) black and white photograph, which were made from crepe paper mounted on wire stems, and involved many hours of intricate work. The Souvenir Programme included the statement ‘Old People in the town will receive a food parcel’. Again, the minutes of the Senior Citizen’s Club indicate that the parcels would have included the items listed below. Mr Webster, the chairman, wished to mark the occasion with an iced coronation cake. The well known local caterer, Mrs E F Looms, undertook to supply the cake (at her own expense). 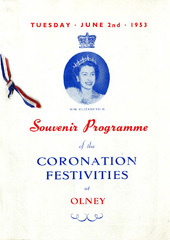 The Coronation Mugs mentioned in the souvenir Programme were supplied to Olney schools for distribution to the children. Understandably, these mugs, although decorative and functional, were of a somewhat basic quality. It would be interesting to learn how any of these mugs have survived intact to this day! Packed with a coronation serviette and souvenir hankerchief in a fancy carton. The ODHS wish to acknowledge Olney Senior Citizen’s Club for the use of the content of its Minute Book.